Just because you can sprout a bean doesn’t necessarily mean you should. Normally, with blogging if something doesn’t come out, my family resorts to heating up a box of soup or the best go-to, chickenless nuggets. I typically refrain from writing about it and either try again another day or decide that it is not worth it. Vegan MOFO is different. I have committed to a month of blogging which makes feel like I should share my failure. Maybe as a blogger I should do this more often. I hear from people all the time that they are trying hard to be vegan, but it is difficult. I guess as bloggers we make it look easy. Don’t let me fool you for a second. In the beginning there was a huge learning curve, at least for cooking fancy meals and cakes. Oh wow, we won’t talk about my first five years of cake baking. Once I finally got it down though, I felt the need to share it with the world. Literally. I sprouted chickpeas. Loved them. Used them all week in recipes. Still loved them. Sprouted adzuki beans. Made raw burgers out of them (recipe will be up in a few days.) Delicious. Went to use the rest of them today in a raw version of a bean dip. Oh geez! So bitter! No matter what I added I couldn’t masque the bitterness. Now the dip is compost. The first day I used them for the burgers, the bean was slightly bitter, but once the dish was complete the bitterness was gone. I knew at that point though, it was a bean that I probably wouldn’t try to sprout again. They unfortunately became worse with time. This month of Dad Says It’s Toxic has definitely been a learning curve. My mom is happy, she has lost 8lbs in 14 days which will only help with her health issues. She isn’t feeling as sick as she did in the beginning and she is actually reading up on doing raw full time. Dad had to go back up on his dosage of Prednisone, but said he managed at a lower level longer this time before the aches came back. I feel absolutely great. It has been a super stressful month and despite my tendency to have issues with depression I have stayed on a high. Plus my energy levels are amazing! Enough about me. Back to sprouting. 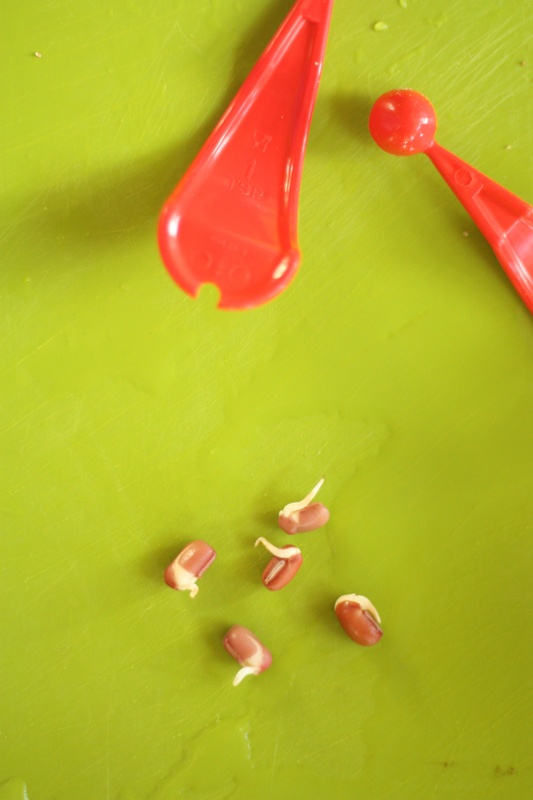 If you have sprouted, what is your favorite bean? Have you had one you didn’t like sprouted? Lentils are the EASIEST to sprout, and are super delicious and full of protein. Try them! Just started sprouting beans myself. Lentils, mung beans, great! Chickpeas sprouted, but I let them sit too long, and I had to toss them. Sunflower seeds didn’t sprout at all. But I’m having fun trying! I think I enjoy the process as much as the finished product so I will keep trying different varieties. It is fun! So far I’ve tried sprouting red lentils, mung beans, and broccoli seeds. I’ve loved them all! i love sprouting mung beans. they are my go-to sandwich topping in term of sprouts. also lentils of course. and for sth fancy, red radish sprouts. yum! I found alfalfa seeds the best, easiest and the tastiest! Never fails!